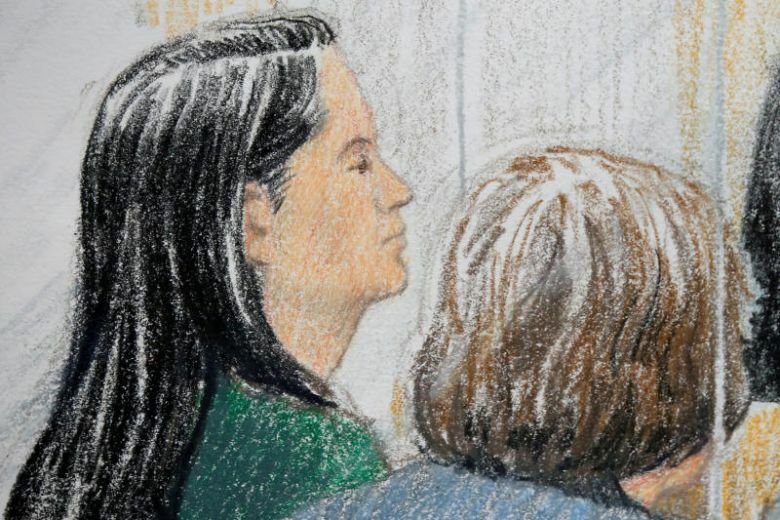 VANCOUVER - A Canadian provincial court weighing whether to grant bail to a top executive of Chinese telecoms giant Huawei Technologies [HWT.UL], who is facing possible extradition to the United States, adjourned on Monday without deciding her fate. US prosecutors want Chief Financial Officer Meng Wanzhou to be extradited to face accusations she misled multinational banks about Huawei's control of a company operating in Iran, putting the banks at risk of violating US sanctions which would incur severe penalties, court documents said. Meng, the 46-year-old daughter of Huawei's founder, was arrested on Dec. 1 as she was changing planes in Vancouver. In a sworn affidavit, she said she is innocent and will contest the allegations against her at trial if she is surrendered to the United States. The judge in Monday's bail hearing said he rolled the proceedings over to Tuesday at 10 a.m. PST because he wants to hear more about the issue of surety - who will take responsibility for Meng's actions if she is released. Meng's lawyer David Martin, who told the court high-tech surveillance devices and a 24-hour security detail would ensure his client does not flee and proposed a C$15 million (S$15.4 million) bail guarantee, had offered her husband as surety. But the judge and the public prosecutor called into question whether Meng's husband could perform this duty as he is not a resident of British Columbia, where Vancouver is located, and would not suffer if she were to breach her bail conditions. Meng's arrest has roiled markets over fears it would exacerbate tensions between the United States and China, already at a high over tariffs. The two sides have agreed to trade negotiations that must be concluded by March 1. Beijing has demanded Meng's immediate release and threatened "consequences" for Canada. But both Chinese and US officials appear to be avoiding linking her arrest to the trade dispute. Meng's lawyer offered C$14 million in property equity and C$1 million in cash as a guarantee. The public prosecutor said he wanted half in cash and half in property. At one point the judge asked why Meng had avoided travel to the United States since 2017 if not to avoid arrest. Martin cited a "hostile" climate toward Huawei in the United States. "I ask the court to ask itself, what motive could she possibly have to flee?" Martin said, arguing the evidence against her was not overwhelming. "If she were to flee, or breach order in any way ... it doesn't overstate things to say she would embarrass China itself." Meng appeared confident in court early on Monday, smiling and taking her lawyer's arm. But by mid-afternoon she appeared more tense, gesturing rapidly as she conferred with members of her legal team. She has argued she needs to be released because she has severe hypertension and fears for her health. Huawei is the world's largest supplier of telecommunications network equipment and second-biggest maker of smartphones, with revenue of about $92 billion last year. Unlike other big Chinese technology firms, it does much of its business overseas. "We will continue to follow the bail hearing tomorrow. We have every confidence that the Canadian and US legal systems will reach a just conclusion," the company said on Monday.